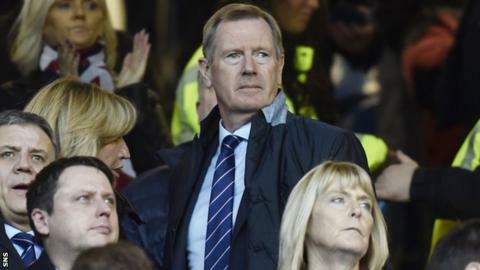 Rangers chairman Dave King will not have to fulfil his £8m offer to buy out other shareholders in the football club. The chairman of Rangers International Football Club (RIFC) was forced to make the bid under legal takeover rules. The deadline for the £8m share offer was on Friday. And Rangers have stated that the 20p-per-share offer failed to reach the level at which the buy-out of smaller shareholders would have been triggered. "The acceptance condition has not been satisfied," they said. "In accordance with the terms of the offer, forms of acceptance and share certificates will be returned to shareholders within the next 14 days." King had been obliged to make the offer by the Takeover Panel, which ruled that he, George Letham, George Taylor and Douglas Park had acted "in concert" to acquire more than 30% of the Ibrox club's shares in 2015. The South Africa-based businessman had fought the demands of the panel and was close to facing a hearing for contempt of court, following court rulings against him, when he finally relented in January. The total cost could have been £19m, but this was reduced to £8m by securing the agreement of further shareholders that they would not take up an offer from him. That threshold would have meant less than half the shares would have been in minority ownership - outside the control of King and his investing partners. Professional advice to the independent directors of RIFC was that investors might want to accept the offer if they were focussed on growth in value of their shares, or needed to realise their asset by selling it.